May the Force be with you, in the mighty Marvel manner! The classic original Star Wars comic-book series begins with an action-packed adaptation of Episode IV A New Hope, then continues the story of Luke Skywalker and his rebel friends as they fight on against the Empire in the dark shadow of Darth Vader! New planets and new perils await – like the Cloud Riders, the Behemoth and the space pirate Crimson Jack. Han and Chewie need six allies to make eight against a world – and one of them will be cult hero Jaxxon! Luke and the droids end up trapped on a Doomworld! And the Big Game will pit rebel against rebel! 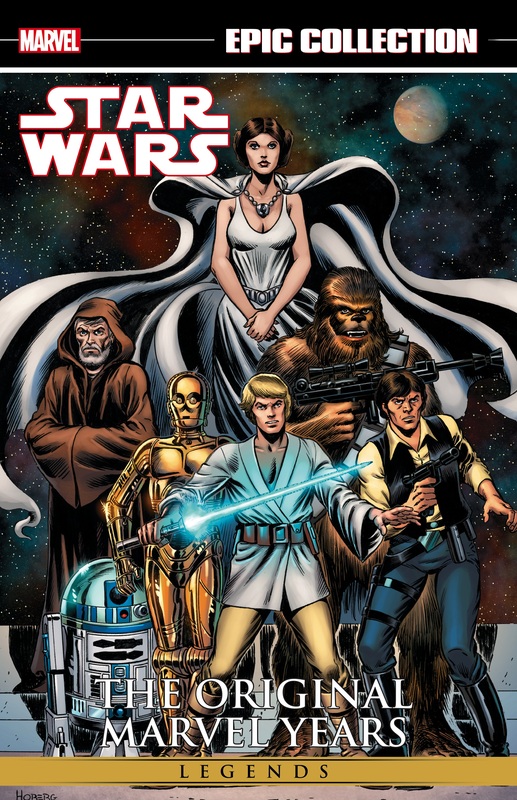 Hinweis: Das Cover dieses Bands stammt von der Rückseite von The Marvel Special Edition Featuring Star Wars 1. Es wurde von Chris Sotomayor neu eingefärbt.